There I was bumping along on a winding dirt road up into the highlands of Hermosa Beach. My friend and Re-Max Agent, Hannah Fletcher, was off to view a new listing. She grabbed my interest when she said the ocean views were beyond stunning. I grew up in a home overlooking the Santa Monica bay so not only do I love ocean views but I was sure my childhood ocean views would easily rival these. So I jumped in her truck and off we went, down the coastline and up the mountain. Up, up we went passing through a lush, green rain forest setting. If I listened closely enough, I could hear and then see monkeys swinging from tree to tree and brilliant Macaws playfully sailing along the blue skyline above. I must confess I wondered how we could ever be traveling to a place where someone actually lived but then the road flattened out and there it stood; a beautifully designed home that would rival anything seen in the States. As I exited the truck and turned in a circle I was in awe of what I was seeing. The ocean views were at nearly every side of me. And the distant I could see up and down the coastline went for miles. The builder of this lovely tutor style home, took full advantage of these magnificent views. As we entered the main level of the home all walls were glass. From the modern kitchen to the tile deck that surrounded the living and dining area, all you could see was ocean, ocean, ocean. Complimenting this was a swimming pool also looking out over the ocean and a lower level bedroom area where all 3 bedrooms maintained a stunning ocean view. The home occupied a double lot covered with many colorful flowers, tropical plants, fruit trees as well as trails and even a picnic area. I must admit, I started this adventure a bit skeptical but the Hermosa Highlands and their incredible ocean views have made a believer out of me. I believe I have just experienced the most incredible ocean views ever seen in my life time and I found them at the top of a bumpy dirt road in the Highlands of Hermosa Beach, Costa Rica. 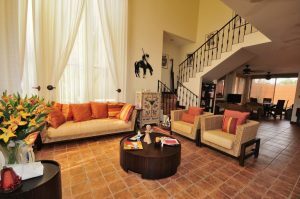 Contact Hannah Fletcher at the REMAX Oceanside Realty Jaco Beach office in Costa Rica for your luxury real estate needs. Beachfront Bargain Hunt featuring Shawn Fletcher with RE/MAX in Jaco Beach, Costa Rica. Early in 2016 I had the pleasure of filming an episode of Beachfront Bargain Hunt by HGTV as the buyer’s agent for Richard and Kim Clarke here in Jaco Beach, Costa Rica. Richard and Kim were visiting Costa Rica for the first time with no real intent to purchase property although they had a desire to own a beach property outside of the United States. They came to me with their wish list looking for a house or condo with 2 bedrooms, 2 bathrooms, ocean view, close to town and ability to rent while they aren’t occupying the property. Kim also wanted to be close to a work out facility and they had a budget of $300,000. In the Beachfront Bargain Hunt show, we toured 4 properties starting with an oceanfront condo complex called The Palms. Within the last week I had obtained an amazing deal on a 7th floor condo with stunning ocean views featuring 2 bedrooms, 2 bathrooms among 1,485 square feet and fully furnished at a list price of $269,000. Adjacent to The Palms is a hotel and casino called Croc’s that features 3 restaurants, a coffee shop, a night club, a Las Vegas style casino, convenience store, day spa, salon and a gym that Kim could use. I thought that this property ticked off all the categories that they were looking for including great rental potential. From The Palms we went to an oceanfront community of townhomes called La Flor. Here we toured a 3 bedroom, 2.5 bath house with a garage that comes fully furnished at a price of $249,000. The house is 2 floors and the largest property we viewed at 2,100 square feet. Richard really liked the extra square footage and bedroom but Kim didn’t like that she couldn’t see the ocean even though the house was just a few steps to the sand. From La Flor we headed to Acqua Condominiums that is an upscale 8 story tower located closer to town where we viewed a 7th floor 2-bedroom, 2-bathroom unit with huge views of the Pacific Ocean and tropical backdrop of Jaco Beach. The condo and the building itself is first class with the finest of materials and craftsmanship. The list price was at the top of their budget at $299,000 but it had everything they were looking for including an onsite gym and picturesque infinity pool. For the final property I wanted to show them something different and a little out of the box so I brought them 20 minutes south to an ocean view lot in a development called Costa Esterillos. The lot listed at $94,000, is 3,500 square meters in size (a little shy of an acre) and has panoramic views of the ocean and has water and power connected to the property to where Richard and Kim could build a custom home in about 6 moths. They were excited about the possibility of designing their dream house that could be done within their total budget but they were concerned about being away from town and Kim wasn’t thrilled about waiting 6 months. The Clarke’s did end of purchasing but I don’t want to spoil the show so you’ll have to tune it to see what they selected. See Beachfront Bargain Hunt on HGTV. Contact Shawn Fletcher for more information on these Beachfront bargains or for any of your Costa Rica real estate needs. Hola lectores! Saludos desde la tierra del Pura Vida, Costa Rica! El día de hoy queremos compartirles algunos consejos para cuando decida comprar la casa de sus sueños! Es nuestra responsabilidad en REMAX Oceanside Jaco, asesorarle en todo el proceso a la hora de comprar una propiedad en Jaco, sea este lote, casa o condominio. Hello readers! Greetings from the land of Pura Vida, Costa Rica! Today we want to share some tips for when you decide to buy the house of your dreams! It is our responsibility at REMAX Oceanside Jaco, advise throughout the process when buying a property in Jaco including lots, houses or condominiums. Nuestro primero consejo es definir sus preferencias a esto nos referimos a tus necesidades y presupuesto. Pregúntese ¿Cuántos cuartos? ¿Piscina? ¿Cuánto tengo disponible? ¿Qué es lo que busco? Tome papel y lápiz y escriba sus gustos y preferencias junto con su presupuesto. Our first tip is to set your preference to this we mean to your needs and budget. Ask yourself How many rooms? Pool? What do I have available? What do I want? Take paper and pencil and write their tastes and preferences along with your budget. Segundo consejo… Saber en qué lugar quieres comprar y hacer esta inversión. Algo muy importante de la ubicación es tomar en cuenta la distancia a los colegios, supermercados, parques, hospitales y todos los servicios que tiene esta comunidad por ofrecer. Second advice … Carefully consider where you want to buy and make this investment. Take into account the driving points of each neighborhoods such as the distance to schools, supermarkets, parks, hospitals and all the services that this community has to offer. Tercer consejo: Asesórate! Nadie debería comprar una propiedad en jaco sin un agente de bienes raíces educada y honesta ANDA buen abogado. Reúnete con un agente de bienes y raíces que sea confiable y que tenga credenciales esto con el fin de que te pueda asistir de la mejor manera. Es su responsabilidad llevarte a un tour de propiedades para que puedas analizar que hay disponible en el mercado y cuáles son las mejores ofertas disponibles acorde a tu presupuesto y preferencias. Third tip: Seek advice! No one should buy property in jaco without a educated and honest real estate agent anda good attorney. Meet a licensed real estate agent that is reliable and has credentials this in order that you may assist in the best way. It is your responsibility to take a tour of properties so you can analyze what is available in the market and what are the best deals available according to your budget and preferences. Cuarto consejo: Investiga! Todo con respecto a la propiedad (paredes, techos, años de construcción, si hay que hacer arreglos, revisa paredes y el estado en general de la propiedad. Analiza las reglas de los complejos y obtén toda información de los gastos de mantenimiento mensuales, impuestos municipales y de lujo y cualquier otros gasto extra que vaya a tener la propiedad. Fourth tip: Research! Everything about the property (walls, ceilings, years of construction, whether to make arrangements, check walls and the general condition of the property. Analyzes complex rules and get all information monthly maintenance fees, taxes municipal and luxury and any other extra expenses that you will have the property. Quinto consejo! No te apresures….. Compra inteligentemente! Compara precios junto con tu agente inmobiliario y oferta! Fifth advice! Do not rush … .. Buy smart! Compare prices with your realtor and make your offer accordingly! De parte de REMAX deseamos que esta búsqueda sea placentera! Te invitamos a que visites nuestra página web, estamos seguro que encontraras opciones sensacionales de propiedades en Jaco, Los Sueños, Hermosa, Esterillos, Punta Leona y más! From REMAX we hope that this search will be pleasant! We invite you to visit our website, we are sure you’ll find sensational property options in Jaco, Dreams, Hermosa, Esterillos, Punta Leona and more! Su especialista en bienes y raíces! Your specialists in real estate! En REMAX Oceanside Realty, ofrecemos una guía completa de bienes raíces para la compra y venta de propiedades en Jacó, Herradura y el Pacífico Central de Costa Rica. Busca en cientos de listados de apartamentos, casas, lotes y bienes raíces comerciales. Vea nuestra guía de información completa a compra y venta de su próxima casa o propiedad en Costa Rica. At REMAX Oceanside Realty, we offer a complete real estate guide to buying and selling properties in Jaco, Herradura and the Central Pacific of Costa Rica. Search hundreds of listings for condos, houses, lots and commercial real estate. 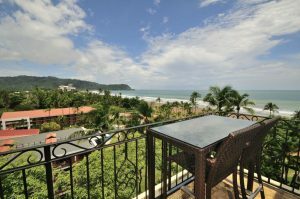 See our complete information guide to buying and selling your next home or property in Costa Rica.